In a March 27th filing, the SEC has moved to voluntarily dismiss two claims of securities fraud against TelexFree defendant Faith Sloan. The two claims pertain to alleged violations of the Securities Act. No reason for the voluntary dismissal is provided. The remaining claim the SEC has against Sloan is a $1.2 million summary judgment, which is still in place. Without reasoning it’s difficult to assess why the SEC has dropped the securities fraud claims. Given they’re still pursuing the summary judgment perhaps the SEC is happy with just recovering Sloan’s TelexFree gains plus interest. I can’t speak to Sloan’s specific finances but maybe after returning $1.2 million there won’t be much left. Still, it remains a bit of an odd move by the SEC. In the absence of a settlement they typically tend to pursue judgment regardless of whether the offending party’s finances. SCF Token is part of Super CodingFly, an MLM crypto Ponzi scheme we reviewed a few days ago. Given Sloan’s continued public participation in fraudulent schemes, the SEC’s decision to drop securities fraud charges against her is certainly ironic. 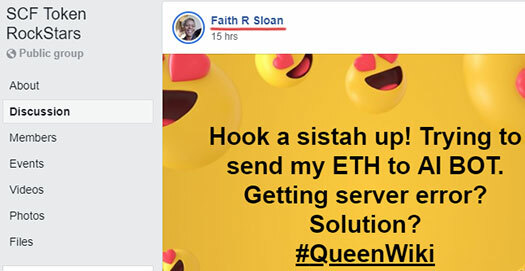 Update 12th April 2019 – Pending approval of a proposed settlement with the SEC, Faith Sloan’s trial has been postponed to June 10th. now the authorities are ridiculous, they allow criminals to get rich by cheating millions of people and are almost complicit, years and years without justice, the only thing they had to do and take this lady and put her on the electric chair at maximum voltage without investigating too much, and instead continues to defraud the undisturbed people, at this point the defrauded people have the right to challenge a gun and take justice on its own. Let’s hope that the SEC’s strategy is focusing on “get the money back” and leaving the heavy lifting up to the Department of Justice.